It is. That's why it's at the CoW. What can be done with that 4-plex in the future? We would need the "missing middle" zoning changes Peter has talked about, right? I *almost* wish they would just take that property. But I'd rather see a different development there if possible as this thing is pretty bulky as-is. A three or four story structure would fit better. No way the city allows deliveries through the alley. The only way in would be on 26th Street for 27th is too narrow even for small delivery trucks. 26th alley entry would be problematic as well with entry and exit. There will be long traffic stoppages for entry of vehicles needing to stop and back in and out. I have seen this on a regular basis with food and beverage deliveries to Bulldog and Nightingale on the other side of 26th. grant1simons2 wrote: It is. That's why it's at the CoW. I don't think it's the CoW's responsibility to fix a developer's broken site plan for them. They should be coming in with something that's at least workable. A developer can pretty much go to CoW whenever it pleases, but CoW can ask that they come back before that project goes to the planning commission. The developer could just be testing the waters with CoW to see what the cities reaction to this will be. If I were Dan, I would be doing the same, especially since Lyn-Lake was such a big deal. After reading some comments about moving a house, I don't think you guys understand the red tape or hoops the city has in place to make this difficult. I tried to move a very nice single family home onto the former empty lot at 22nd/Garfield and had support from the Whittier Alliance as it would contribute to increased home ownership instead of rentals but the city planning department squashed me like a bug and said they would never approve the set back variance I would need. The house unfortunately ended up getting leveled. Looks nice! Digging the asymmetrical setbacks. great design, I'm really enjoying the color schemes to it! adverse shadowing impact on the residential properties to the east and northeast. building more than what is proposed (see attached for examples). design and to explore breaking the building up vertically. This is pretty unlikely to get approved in its current state. 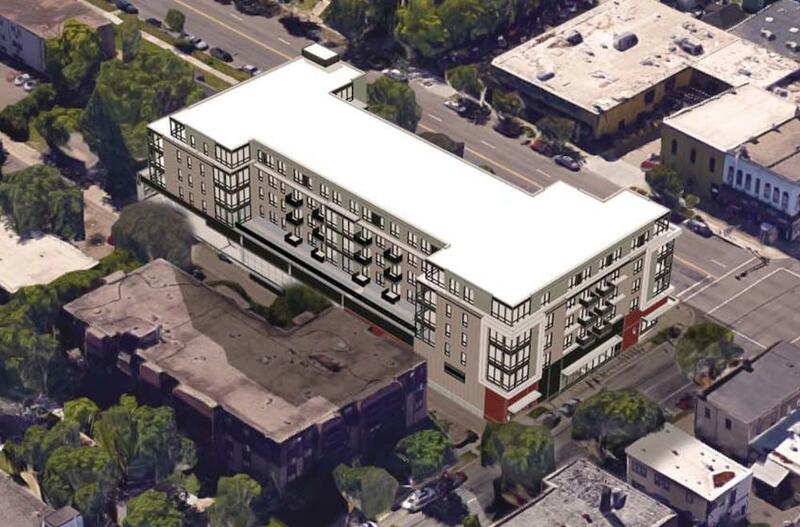 I like what they've done with the upper floor massing along Lyndale, but they are still proposing to build 5 stories straight up on the property line along the alley. That would be awful. Why even propose something so ridiculous? They really need to step back the upper floors along the alley. The last bullet point is less of a concern at this time as it will almost certainly be addressed in future plan revisions. Traffic/circulation: They are going to run into a lot of resistance by having the only vehicular entrance along Lyndale. Unless they somehow straight up prohibit left turns into the property (with a median), people are not going to like that. The congestion caused 4 blocks north of here at Wedge Co-op is pretty universally despised. At least cars won't be coming out onto Lyndale, but still...can you imagine cars on southbound Lyndale trying to turn left across 2 lanes of traffic to get in here? Especially with no stoplight at 27th to stop the flow of northbound traffic, northbound vehicles move pretty fast here and gaps are few and far between. IF they can prohibit left turns into the project, then everything is fine. It's in the middle of the block, so I'm not sure how you would even do it with signage. I don't know how you actually accomplish that without installing a median. And if you DO somehow prohibit southbound cars from turning left, how do they get into the project? The fact that 26th and 28th are one-ways, and there's no stoplights at 25th and 27th make "around the block" movements really difficult. The former is extremely problematic for so many reasons, to the point it can probably be thrown out. The latter could be fixed with a signal at 27th & Lyndale, which arguably should happen anyways. Man, even people participating here think a five story building is too big? Okay. The neighbors along the alley are a three and a half story apartment building and a two and a half story one. They'll be fine. 5 stories straight up, 0' setback from the property line along the alley is pretty unprecedented. I have no issue with the height itself, it's the massing. Isn't it only straight up along the property line on either end (i.e., isn't the length of the building shaped like an I)? It's a pretty fat I.
I agree that the circulation is the biggest concern here. I'm really skeptical that the semis are going to be able to maneuver through the narrow alley like they're suggesting, especially given that this narrow alley theoretically serves two-way traffic. And the vehicular access from Lyndale is problematic for all of the reasons that twincitizen lays out. The decision to push the bulk of the north-south bar of the apartments towards the alley rather than towards Lyndale is curious, but wouldn't be a deal killer for me. EOst wrote: It's a pretty fat I.
I believe "bold" is a more socially acceptable term. amiller92 wrote: Isn't it only straight up along the property line on either end (i.e., isn't the length of the building shaped like an I)? amiller92 wrote: Man, even people participating here think a five story building is too big? Okay. I see the purity police are on patrol today. Not exactly the same situation, but the apartments at W Lake St and Knox offer a pretty good comparison on the alley setback. From the looks of it, there's 0' (or near zero) setback and nearly solid massing at the alley. Doesn't look great, but it doesn't bother me either.